We were Lawless were formed in early 2013. Originally a three piece, the band comprised of Steve Cullen (guitar and vocals), Dave Foulger (drums) and Jon Betz (bass). Early rehearsals produced some original garage punk type songs and a few cover versions of Nirvana, Beastie Boys and Tom Waits amongst others. The band started gigging in local venues around Hebden Bridge and Halifax and soon gained a reputation as great live band. This led to gigs further afield in Leeds, Manchester, Stoke and Nottingham to name but a few. While cutting they’re teeth on the gig circuit, the band continued to rehearse new material and self produced and recorded two albums worth of songs. The songs became a more unique mature sound taking influence from many different genres and styles. Elements of Punk, Blues, Jazz, Country and Ukrainian folk music can all be heard. A new addition to the band in December 2014 helped to solidify the bands sound. Sebastien Degorce brought a unique impressive second guitar part to the band, allowing a more experimental almost Avant-garde approach to some of the songs. Sebastien fit into the band perfectly and within weeks it was like he’d always been a part. The addition of another guitarist also allowed Steve to concentrate more on the vocals, sometimes leaving the guitar entirely to Sebastien. With the deep rumbling bass of Jon, pounding drums from Dave, screaming lead from Sebastien and Steve’s growling voice, the Lawless sound was complete. “Steve writes about the afflictions of modern times, and while the themes are sometimes difficult – suffering, poverty, addiction and war being just a few examples – the lyrics are nevertheless poetic. In fact, war poetry comes to mind, with the words stirring up a real sense of strength and rebellion in your soul. Far from being gloomy and dispiriting, the music has a positive and empowered feel to it, and they have no trouble exciting and inspiring a crowd.”(localsoundfocus.com, 2015). 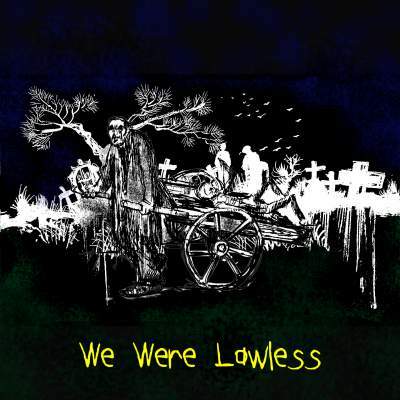 We were Lawless have recently recorded a four track EP at Robinwood Studios in Todmorden, West Yorkshire and remain busy writing and rehearsing new songs, as well as playing live gigs. They play at Beat herder festival on the 18th July and hope to play many more shows. The EP is available through iTunes, Amazon, Spotify and more. “Lawlessness usually has negative connotation but this band have turned it into a positive force.” ( Lou Wowski 2015).